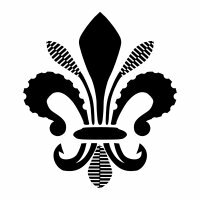 In araldry, lily of Florence is the name that is given to the blooming iris, as it is represented on many coats of arms. Michele requested a Maori-styled lily of Florence. To achieve this, some traditional stylized Maori designs were used, like the fern, the fern bud, or koru, and the fish hook, to indicate protection and prosperity.